This is the first in an occasional series of posts about strange and creative cycling products that I’ve tried, for better or worse. There’s a lot of victim-blaming in the fact that, in many jurisdictions, cyclists are forbidden from riding with earphones while motorists, who create far more danger, are allowed to seal themselves off from the world in sound-insulated cars. 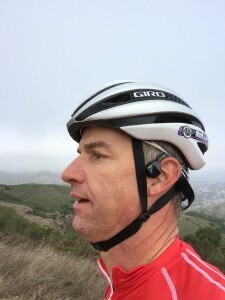 Many cyclists flout this rule and simply wear earbuds. 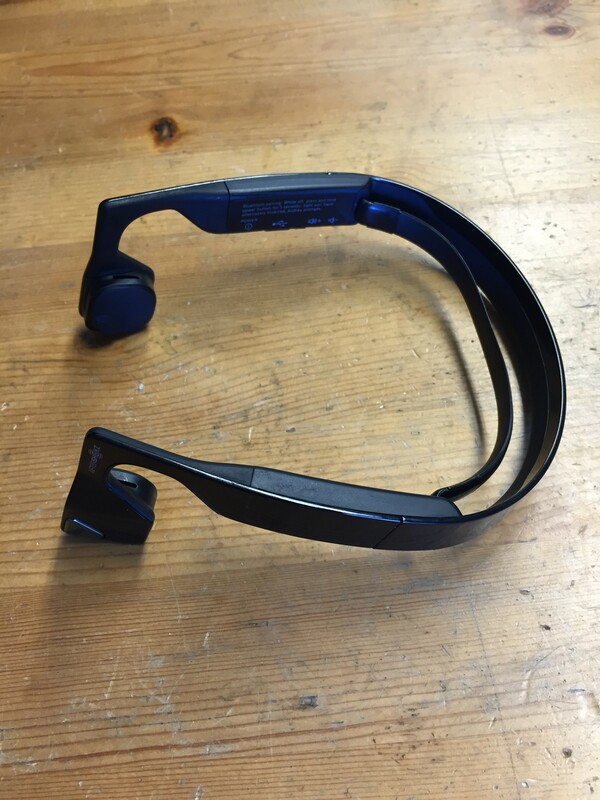 The Aftershokz Bluez 2 Bluetooth Headphones take a different approach, complying with the letter of the law by keeping your ears unblocked and transmitting sound through bone induction. I generally prefer to ride without music but from time to time on a long ride it’s nice to have some tunes. It’s also convenient to be able to practice languages or listen to podcasts while riding and to answer an occasional phone call. These wireless, rechargeable headphones sit comfortably on top of my helmet straps and sunglasses, weigh very little, have ample battery life and deliver adequate sound quality. I’m surprised by how much I like using them. Wireless headphones are much more convenient for cyclists than wired earbuds, and the off-ear bone induction allows plenty of ambient sound to warn me of traffic. There are a few disadvantages. First and most importantly, music or podcasts are distracting even if the headphones don’t block outside sound, so I tend to use these only when traffic is light. The sound quality from these is only adequate, it’s not great. The quality and timbre of the sound varies depending on how free my eustachian tubes are – yawning changes the sound! The headphone emit sound to those around the wearer so I tend to mute them when I encounter other riders. Finally, the control buttons are really small and hard to use when riding. Still, at only $80 I think these are a bargain and are worth a try. They would be a good gift for the cyclist who has everything.